Built-in Compliance Mechanisms. Instant Access to short code. Text Messaging is one of the best client engagement tools within any beverage brand campaign. Since most of the engagement tends to happen at live events the marketing teams at the beverage companies need something quick and easy to trigger interaction with the brand. SMS serves this role perfectly since it does not require any extra apps or special knowledge to participate. However, there is a growing scrutiny around the real-time new media campaigns for beverage companies. Regulators and the Brands themselves, both want to make sure that the participants in the campaigns are of legal drinking age. This is solved by deploying smart text message campaigns which interact with the participants and confirm their age before moving to the actual promotion. 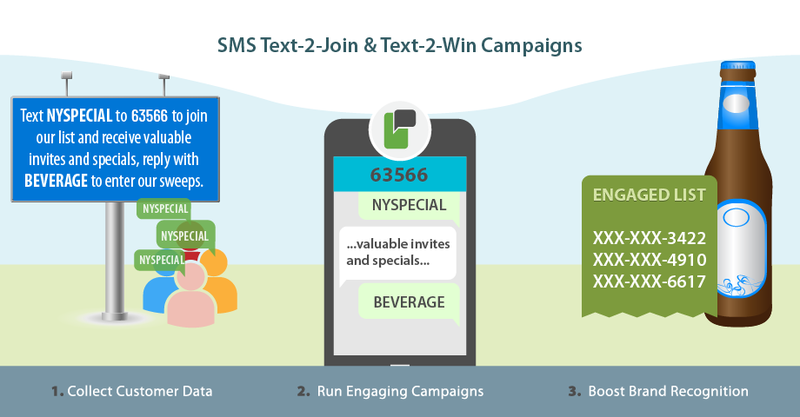 Collect customer data - promote your mobile keyword "Text NYSPECIAL to 82257 to join our list and receive valuable invites and specials"
Text to Win Campaigns - The most popular campaign by far. High participation and brand recognition. Age Gates - Regularly attached to guard the participation in text-to-win contests. Example "To complete your entry reply with your birthdate DD/MM/YYYY"
Ask for feedback - Great for deployment of feedback questions after promotional events and tastings. Example "How did you find our spirit? Tell us how to improve or what to continue doing." Text to inform of any new products in your portfolio - Example "Come in to try our new..."
Text with major sporting events and holidays, and bring traffic to retail locations on key dates - Example "Summer and BBQs are here, enjoy a cold one..."